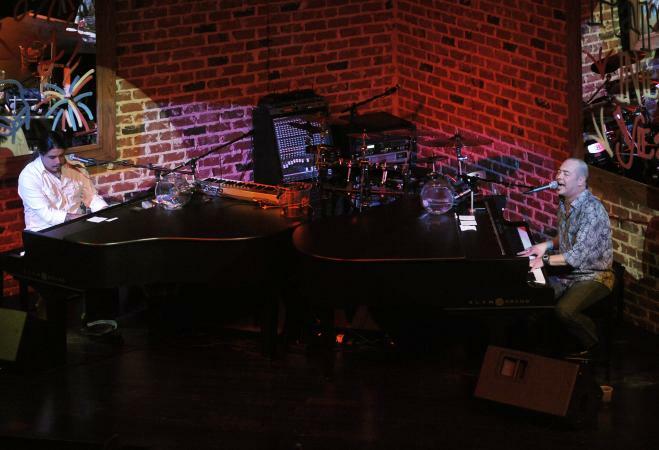 Hosting a dueling pianos fundraiser is a creative way to earn money for your organization. Whether you choose to use hometown talent or a pair of professional musicians, you can rest assured this charitable event is unlike any other. Just as the name suggests, a dueling pianos fundraiser consists of two pianists able to match wits while tickling the ivories. The event typically includes a sit down dinner so it feels like attending a show. Since you'll need to have two full-size pianos in the room, look for a venue with a large stage or open space and doors that open to accommodate them. If you have access to a music hall or theater that already owns two pianos, it can save you time and energy. Check to see if anyone within your organization knows a couple of talented pianists who would volunteer their time. You can also contact local colleges, music schools, music shops, and concert halls to find local talent. Make sure both players are within the same skill level so have a memorable showdown. Host an audition with your options to make sure they play well together and have complimentary, engaging personalities. If you are unable to locate local pianists, there are professional groups that can help. Unfortunately, these usually will not work for free. Companies like Dueling Pianos International allow you to hire talent through their website, and they will hold a sing along and comedy act in addition to piano performances. Pit the pianists against each other in a night-long contest of who can play the longest, loudest, most recognizable, or most difficult songs. Choose one skill to focus on for the entire event or designate one per hour. This type of event works best with a dinner and a show format so it appeals to even those who don't love live music. Plan for a sit down diner so guests won't be moving around a lot taking attention away from the pianists. If you have volunteers who can provide the meals, it will save you money, but hiring a catering company can make the event feel more formal. A dueling pianos night often involves not only great music, but also games, food, fellowship, and plenty of audience interaction. Make it clear on invites and marketing materials this is an entertaining event for all ages. Include tickets with the invitation so recipients can easily purchase them or try to sell them for you. Ticket sales are how you'll make money from the event, so price them well. Make some extra money during the event with structured competitions involving guests dropping monetary tips in each piano's tip jar. Stop the Song Challenge - A guest puts a tip in the jar for one piano and requests a song to be played by that musician. At anytime another guest can put a tip in the same jar to stop the playing of the previous song and request a new one. Rivals Challenge - Choose two rival teams, movies, or famous artists like The Beatles verses The Monkeys or Rent verses Chicago and designate a tip jar for each one. Ask guests to vote for which they'd like to hear a song from by dropping tips in the appropriate jar. Fast or Slow - Choose either fast or slow for a designated time such as thirty minutes. During that time, every tip placed in the jar requires the pianists to either speed up or slow down their tempo. Change the speed every fifteen to thirty minutes to keep guests engaged. The success of this fundraiser hinges largely on ticket sales and pianist personality. Make these planning steps a priority by paying extra attention to their details. Choose a date wisely by steering clear of holidays or other major area events to increase your sales. Maximize guest experience by arranging all tables so every guest is facing the pianos. Try using square or rectangle tables with guests only seated along one side and each end. Work with pianists to select all the music for the evening in advance. Give pianists license to serve the role of emcee, making announcements throughout the event to stay engaged with the crowd. While you plan, keep in mind the event is a fun fundraiser, not simply a piano concert. The more opportunities guests have to interact with the pianists in a fluid way, the more exciting the event will be.